This is about as slim as it gets for a durable minimalist wallet. By using Full-Grain leather, the wallet will hold up against heavy use while disappearing into your front or back pocket. 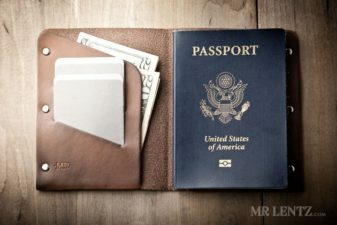 The idea for the slim leather wallet was born out of a need to move my own wallet to my front pocket while seated. It can be painful sitting on a large wallet, and even more painful to realize the wallet itself takes up most of the bulk! These minimal leather wallets work great for stashing all your cash and some cards in a really useful way, and are designed to be as slim as possible.